Odor Description: Fruity, Pineapple, Cider. Waxy and fatty pineapple note. Usage: Gives sweet fruity aspects. As a modifier lifts the top note of fruit complexes and rounds out aldehydes. 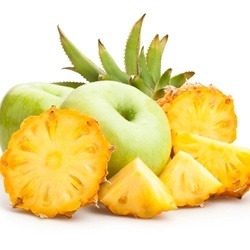 Imparts typical apple and pineapple characteristics. Can use up to 210 ppm in a flavor concentrate.